Elon tweets reminder about Tesla Easter Eggs that are available and there will be more Easter eggs to come. Today Tesla CEO Elon Musk's most recent Twitter update appears to be a fun surprise for Tesla owners. 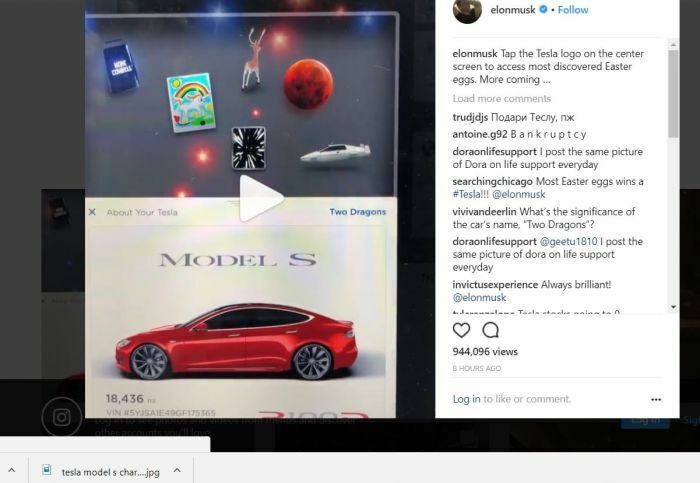 Musk recently showed off some of the new Easter Eggs in his latest Instagram post as well. "Most people don’t know there’s a whole box of Easter eggs with every Tesla. Just tap logo on center screen & wait. Easy access to most of discovered ones. More coming …," wrote Musk few hours ago on his Twitter account and shared this video. What do you make of it? He recently was putting so many different on Twitter, that it is difficult to differentiate the serious stuff from jokes. Like his April 1st prank turned out to real regarding the Teslaquila, a Tequila beverage by Tesla that Musk today confirmed, writing "it's on." I asked Alex Guberman from E for Electric Youtube Channel to comment on Tesla's Easter Eggs. "Yeah, those have been there for a long time now. For example, the Christmas dance that the Model X does is one of the Easter eggs," said Guberman. Musk is teasing something new here. "Most of the time it is something stupid and useless, but some people absolutely love those," added Guberman. As you can see in the Twitter video above, if you want to access the Easter Eggs, simply tap on the console, pick their feature, and enjoy. While there aren't a ton of details available about what each egg does, there are a few things one could guess. For example, there's a cowbell labeled "MORE COWBELL" -- a reference to a Saturday Night Live comedy sketch from 2000 which starred Christopher Walken. This seems fun, but the drivers really need to keep their eyes and attention on the road. I don't think it's a good idea to have these types of "Easter Eggs" for the car drivers. To me, they are just distractions. What about you? Its a distraction because you dont have the sense of humour and useless. I am not the only one saying it's distraction. It's been covered int he media as well. Regarding my sense of humor, what do you know about me to say that?